A rather undignified moment from Jet Attack (American International Pictures, 1958), which starred John Agar, Audrey Totter and Gregory Wolcott. 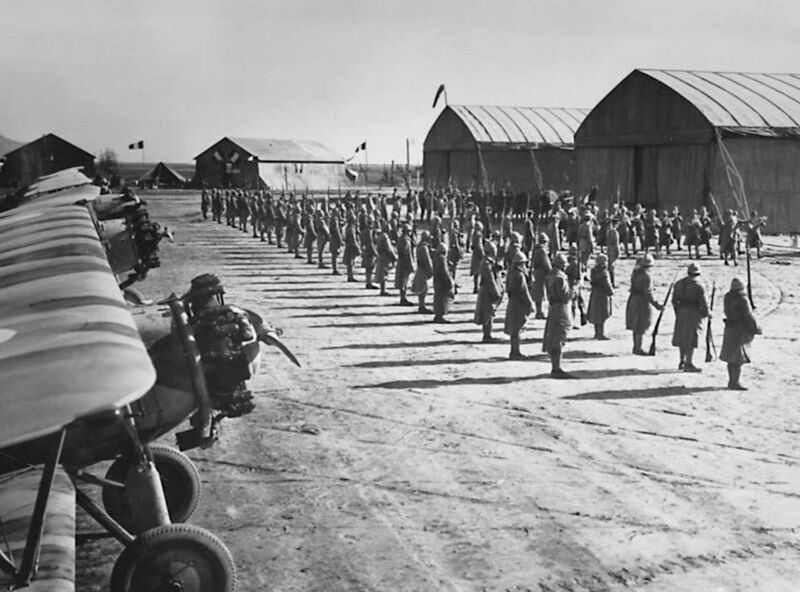 The movie was comprehensively savaged by critics on its release, the incoherent Korean War plot earning the film a spot in the book The 50 Worst Films of All Time. 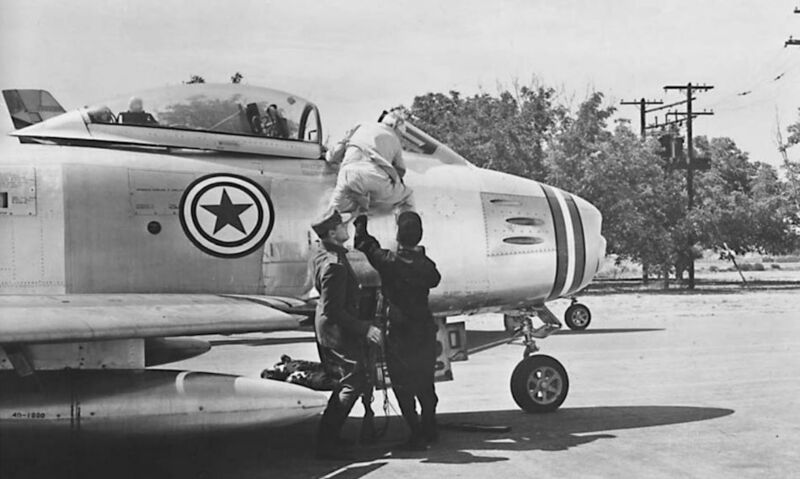 This stinker was made at Van Nuys Airport and used Air National Guard North American F-86A Sabres as Soviet MiG-15s. 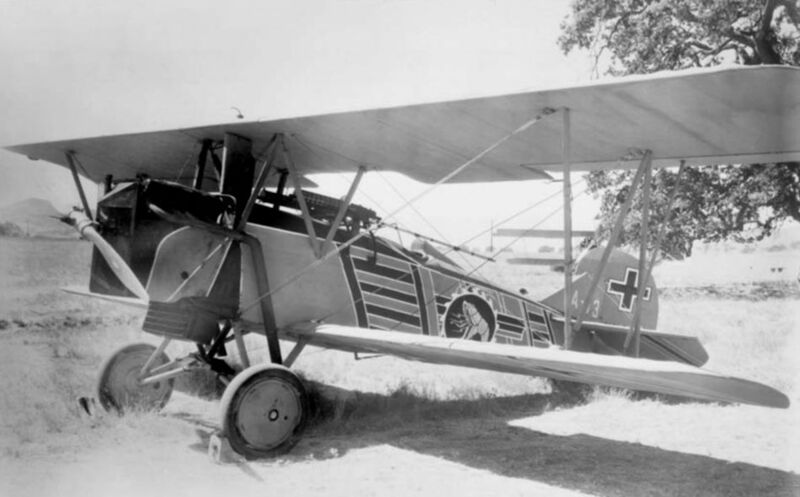 Soviet-style insignia were placed on the fuselage alongside 12in-high letters which read “California Air National Guard”. Hollywood goes to war - based on John Monk Saunders’ story Death in the Morning, Paramount’s 1933 film The Eagle and the Hawk highlighted the psychological stress the Great War had imposed on pilots. Starring Fredric March and Cary Grant, the film used flying scenes from some of the studio’s earlier movies including Dawn Patrol, Wings and Young Eagles. The new footage was shot at the Paramount Ranch in Agoura, California, where a full-scale replica British airfield was built. 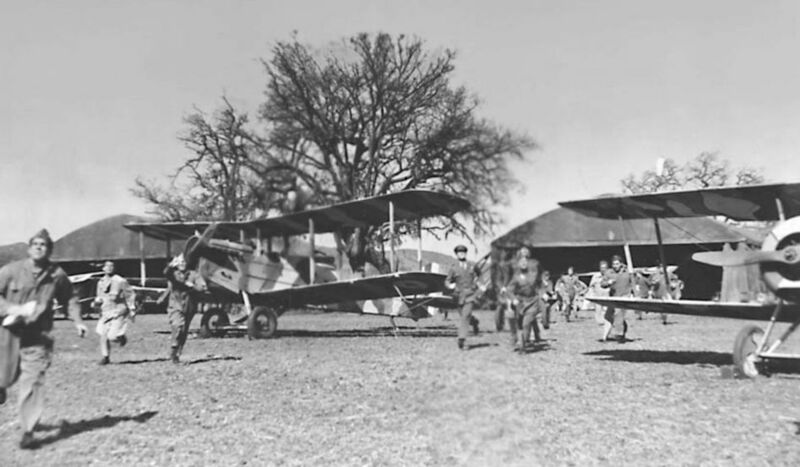 Movie stunt pilot and aircraft supplier Garland Lincoln supplied four Nieuport 28s, five Thomas-Morse SC-4 Scouts, a Curtiss Jenny and a pair of de Havilland DH-4s for the film. Here, the British field comes under attack and airmen scramble past one of the DH-4s and a Nieuport 28. Wooden acting meets wooden aircraft. 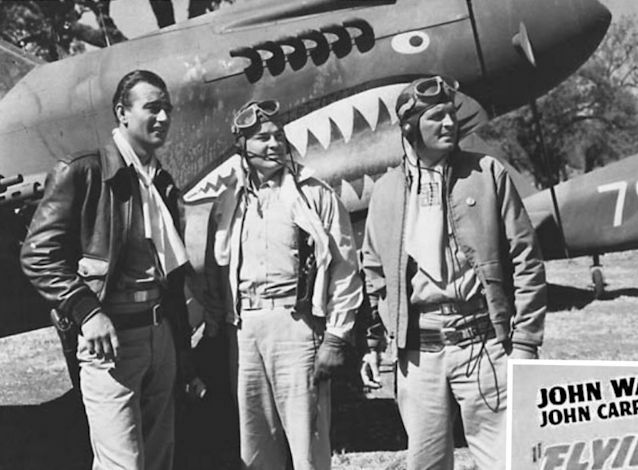 Flying Tigers (Republic, 1942) was John Wayne’s first World War Two-themed movie and was - very loosely - based on the exploits of the American Volunteer Group in China. 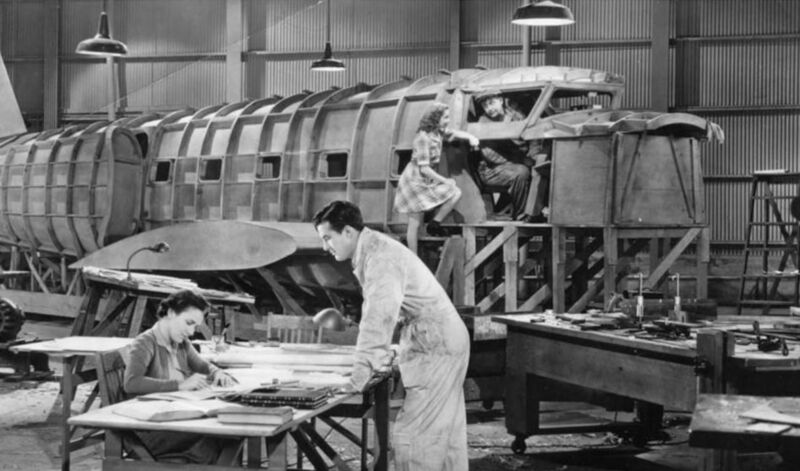 Most of the filming was shot at Thousand Oaks, California, studio carpenters having built a fleet of Curtiss P-40 replicas, some of which were powered by automobile engines for taxying sequences. Because it was one of the first movies made in the wake of Pearl Harbor, it was well received by audiences, who wanted a positive message. One of the better-known aviation-themed films, Universal’s The Great Waldo Pepper of 1975 covered the post-World War One life and times of a disillusioned US Army flying instructor turned barnstormer, played by Robert Redford. The still-impressive flying scenes were shot under the direction of another film flying legend, Frank Tallman. The film met with positive reviews, in no small part thanks to the flying sequences. 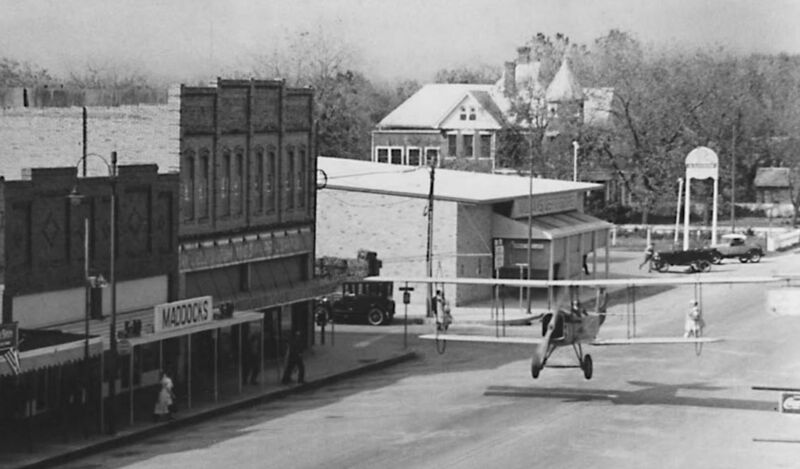 This photograph was taken as Pepper - actually Tallman - flies a Standard J-1 biplane through a small Texas town to stir up interest in the “flying circus” visiting the area. Susan Sarandon played the part of a doomed wingwalker in the film and the dummy visible on the lower port wing portrays her during this challenging flying sequence. The Woman I Love (RKO, 1937) starred Paul Muni as a ‘‘lone wolf” French pilot who develops a reputation for returning from combat missions with dead gunners. The studio recreated a French airfield at Point Mugu, California, and the technical advisor was film flying legend Paul Mantz, who assembled a collection of Stearman C-3s and Curtiss Fledglings, which were painted in period French markings. Wally Timm modified some of the aircraft to appear as Hanriot biplanes (as used in the 1935 French version, L'Equipage).